Doors to walk-in coolers and freezers sustain tremendous abuse as the only moving part of a walk-in: Hand trucks, forklifts, pallet jacks, and everyday use can cause damages to a door that may go beyond repair. These damaged and ill-fitting doors can compromise cooler and freezer efficiency, promote the growth of harmful bacteria and even create a health and safety hazard. 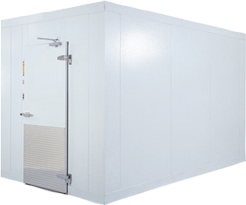 Explore our replacement walk-in cooler and freezer doors to reduce energy costs, counteract bacterial growth, improve access, and prevent workplace accidents. Ordering and installation is simple, and our replacement doors are designed to fit all Everidge coolers and freezers or any other manufacturer’s unit. Everidge walk-in cooler and freezer doors provide safe, affordable, easy access to your cold foods and beverages. Designed and manufactured for long-term use in high-traffic applications, these walk-in cooler or freezer doors are durable, with four-inch thick insulated panels, heavy duty hardware, a heated door jamb, and positive door seal to maintain temperature. Choose from a variety of sizes and finishes, door styles (single slide, bi-parting, or vertical lift), and manual or electric operation. In addition to the replacement, sliding and vertical lift doors for our CrownTonka, ThermalRite and ICS units, our LoTemp Doors brand provides innovative and cutting-edge walk-in cooler or freezer doors, offering you a high-quality, fully customizable product line for any refrigerated storage unit. Brand reliability—competitively priced and supported with Everidge’s robust customer service guarantee—is the promise of Everidge LoTemp Doors: tried and true products from a team with long, experienced history of industry success. To learn more about the LoTemp Doors brand and product line, click here.